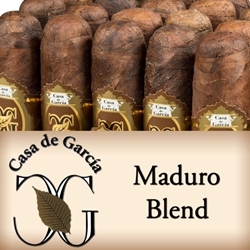 Casa de Garcia Maduro Blend are hand-rolled premium cigars uniquely crafted with aged Dominican and Honduran long filler tobaccos, a Connecticut Broadleaf binder, and a sweet Connecticut Shade wrapper that is sun-ripened to a silky sweet darkened color. Casa de Garcia Maduro premium cigars produce an exceptionally smooth smoking experience topped off with mellow flavors of cocoa, creamy chocolate, cedar, and just a hint of spice. Casa de Garcia Maduro cigars are known for being a top-shelf premium cigar brand with a very modest price tag. Casa de Garcia Maduro hand-rolled cigars make an excellent choice for any cigar connoisseur. Smokers Discounts has made it easy and affordable to buy premium cigars online. A variety of sizes and flavors are listed below at our discount online cigar store. Each of these styles are in stock and available. Call us for more details!